Students at a South Side Chicago high school open up about the Parkland, Florida, shooting, and their views on school safety and gun violence. The TV and Radio Club at Tilden Career Community Academy is a unique platform for students at this South Side Chicago high school. "I just wanted to make sure they did have a voice and really be able to reach some of those audiences with what they do," said Michael Finney, the club's adviser. These students rap, conduct interviews and produce all sorts of media to express what's on their minds. That's a lot like what we've seen in recent weeks from students across the country — young people using their voices to call for an end to gun violence and advocate for school safety. If you listen to some of those voices from Chicago high school students, you'll learn the violence seen in Parkland, Florida, is too familiar. "To be very, very honest, I actually don't have a reaction anymore. It's nothing new. Over here, it's nothing new. But to see it happen to other people, I kind of feel for them because I've been there in that spot," student Lexis Brown said. Keeping students safe here is less about what happens at school and more about what's happening off campus. Chicago's south and west sides see the majority of the city's gun violence. In 2016, Chicago had over 700 homicide victims; many of those killings involved firearms. The number of gun-related deaths dropped in 2017, but people are still being shot and shot at. "We had a town hall with the entire student body, and the first question we asked was, 'Who's been affected by gun violence?' And, of course, half the hands in the audience went up. … We had stories being shared of kids being in cars that got shot up," Finney said. "As we were telling him not to look at them, they shot the car up while we were in the car," student Shareef Peoples said. "And these are things coming from our students who come here every day and walk in like nothing has happened," Finney said. "One of my friends was running. … He got shot in the head in front of my face. I was just traumatized. I still think about it to this day, though," student Edward McElrath-Bey said. "My first brother, he got shot in his chest. And my other brother, he got shot in his leg, in his thigh and in his head. And he died instantly. And I, too, have been shot at," Brown said. "We're going to need after school programs in place. Like, engaging after school programs. Not just Tilden, a lot of our schools. In between that time of 3-7, 3-8, that's when a lot of the violence happens," Finney said. This is part of the reason why Finney says he keeps his classroom open, even after school. 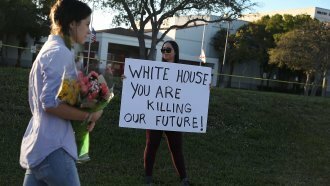 Tilden students have felt the impact of their Parkland, Florida, peers speaking out. 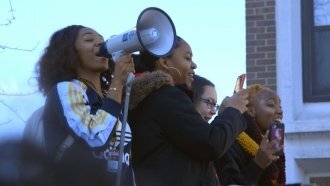 Tilden joined schools across the nation on national walkout day. "We all came out and stood in front of the 'Peace Pole' to show our respect. Some of us shed tears, and we prayed for, like, 17 minutes," Brown said. This shows young voices are not only being heard, but they also have immense power. "To be honest, I like talking about stuff that goes on in my community and stuff like that. It makes me feel like I got more power to change it," McElrath-Bey said.